The term, “ahead of the motion,” refers to the rider’s upper body being too far forward, rather than being “with the motion,” or in balance with the horse. When the rider’s upper body leans ahead of the motion at take-off, the horse will be more inclined to stop at the fences, for the rider’s weight is overloading the forehand at a crucial point in the jumping effort. 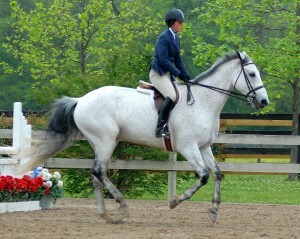 The rider is "ahead of the motion," with her upper body leaning too far forward, rather than staying in balance over the horse. Her leg slipping back on the horse's ribcage is a large part of the problem. However, she is correctly looking in the air toward an upcoming fence on a tight turn, so her mind is working, although her position is weak. 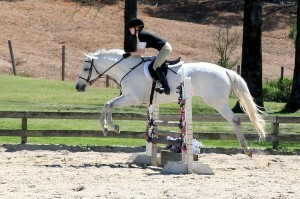 This demonstration rider, Cat Montgomery, is "with the motion" of her horse. Her upper body is balanced over a well-positioned leg. It is always easiest to perform the canter depart as you begin to turn a corner, for the bending shape gives the horse a clear idea of the lead it needs to take to keep its balance. If you are riding in an oval-shaped ring, you can practice the canter depart anywhere along the curves; but it is wisest to pick up the canter when the inside foreleg is on the side of the horse closest to the barn or outgate, for all horses are aware of these locations, and some seem to be drawn toward them like a magnet. Thus, the barn or outgate can be used to help you get the proper lead. Make sure your outside leg–the one toward the railing–is in behind-the-girth position, which is about four inches back from the normal leg position. For a horse that doesn’t want to start the canter sequence properly with its outside hind leg, push the haunches slightly toward the inside of the arena, bending the horse around your inside leg. This will place the horse’s outside hind leg underneath its body, so that only this leg will be able to start the canter depart. At the walk, monitor the footfalls of the horse’s hind legs with your seat, and be especially aware of every time the horse’s outside hind leg is lifting off the ground and striking forward. Press this leg forward in a marching rhythm with your outside leg, until you feel that the horse has enough momentum to push off immediately into the first canter step. The sequence of footfalls should be: outside hind foot; followed by inside hind foot and outside forefoot striking together; and finally the inside forefoot (the leading leg) striking. The horse begins the canter sequence with the outside hind leg, which lifts the other three legs. The inside hind leg and outside foreleg strike together to create the second beat of this three-beat gait. The inside hind leg creates the third beat of the sequence. Notice the motion of the horse in the three pictures above. First the animal lifts its body, then two feet land together, and the final leg lands, with this sequence creating a rocking motion. To practice the canter depart, you can bisect the arena mentally, forming a “point A” on one short side of the arena, and a “point B” on the other short side. Then pick up the canter every time you get to these points. 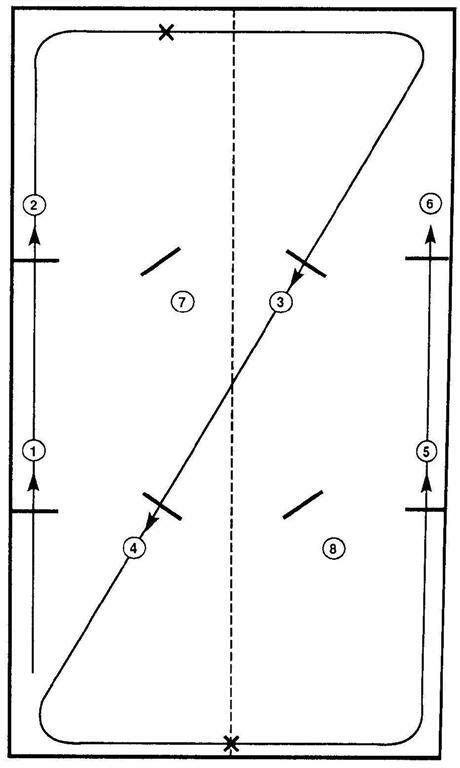 Once the horse is responding well to this exercise, add canter depart points at the middle of the two long sides of the arena, so that you are practicing the canter depart at four points every time you go around the ring. Work through this exercise once the first direction, then reverse and work the other direction. This will not only keep your horse’s training even on both sides, but will also help the animal work through the problems on one side by practicing correctly on the other. If your horse tries to buck, drive it forward with your legs and keep its head up. By keeping the animal level, you’ll make it impossible for it to let out a big buck. You may even need to hit the horse with your riding crop, just behind your calf, to drive it forward. The punishment should not be abusive, but it should be uncomfortable enough that the horse learns not to buck again. If it attempts to rear, also use your legs to drive it forward. Be sure to lean forward as the horse’s front feet leave the ground so that your upper-body weight can help to push the forehand downward. (If a horse rears and the rider leans back, he can cause the horse to fall backward.) Once again, the stick is the correct punishment. The horse should be made to gallop as part of the correction for his unwillingness to go forward, as demonstrated through rearing. 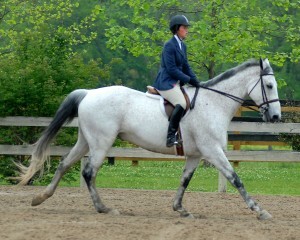 Before a show, give your horse a fairly hard workout, so that it’s a little tired. If the animal still looks as though it’s fresh at the show, longe it before you get on. If the horse is a little tired, it won’t be so prone to buck or rear. The proper half-halt requires the hands to close together simultaneously, so that equal pressure is created on both sides of the horse’s mouth. It is incorrect for the hands to wring the horse’s head from side to side. In fact, the wringing motion will prevent the horse from being able to find the bit, for the bit must be stationary for the animal to establish steady, but light, contact with it. The lightness on the bit that you see when watching very good riders is not an illusion, but simply a reflection of the rider’s ability to push his horse to the bit, while keeping a light, but steady, feel through the use of half-halts. It is true that some horses are easier than others to put on the bit, but barring conformational restrictions (such as a very short, thick neck or a ewe neck), every horse should be able to be put in a medium frame. 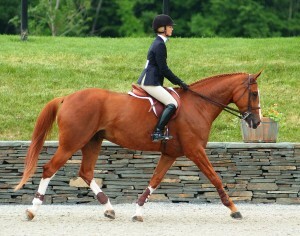 Of course, it is more difficult if the horse has never before been ridden on the bit. In this case, the muscles in the horse’s neck may be less flexible than in a horse that has been trained properly, and, due to discomfort from trying this new position of the neck, the horse may object to your hands. It is important when training any horse–young or old–to give frequent breaks during flatwork, so that the horse doesn’t become uncomfortable and fight you. The horse is "on the bit" and moving with impulsion as Maria Schaub competes in the flat portion of a USEF Showing Jumping Talent Search Class. The horse's calm expression indicates that it is willingly submitting to the rider's aids---a mark of excellent horsemanship. It has always been easier for me to remember shapes than numbers. For this reason, I have never thought of a course as fence 1, fence 2, fence 3, etc., but have always memorized the shapes of the lines within a course. To do this, separate the segments of the course into outside lines, inside (diagonal) lines, half-turns, half-turns in reverse, circles, figure eights, and so on. 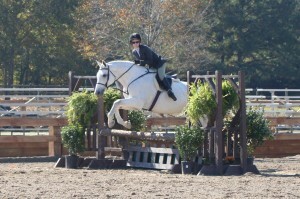 In equitation and jumper classes, it is particularly helpful to think of the segments as shapes, since the courses are usually more complicated than those found in hunter classes. Memorize your course as early as you can and be sure to walk it before you ride it. When walking between the fences, pay attention to your approaches to the lines and decide at what point you should look at the upcoming line. Work this strategy into your plan, so that your eyes will automatically turn toward the line when you get to certain points on course. Discuss the course with your coach; or, if he or she is not available, go over it several times in your mind, until you are sure you know where to go. Finally, think about your plan just before you enter the ring, so that it is fresh in your mind. 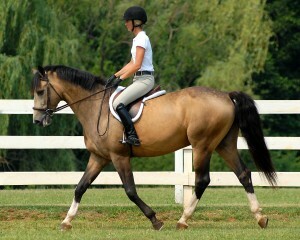 The working trot sitting is performed at the same tempo as the working trot posting –no slower. 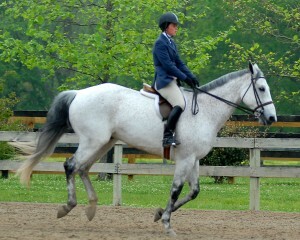 During the working trot sitting, the upper body is only a couple of degrees in front of the vertical. This nearly upright position allows your weight to sink into the horse’s back, so that you are firmly glued on and able to follow the motion with your seat and lower back. Shown at the working trot sitting, Maria Schaub correctly keeps her upper body in the same position as at the walk, just a couple of degrees in front of the vertical. To practice the sitting trot, drop your stirrups, pull the buckle on each stirrup down about six or eight inches, then cross the stirrup leathers over the horse’s withers. If you turn the top strip of the leather upside down before you cross it, your inner thigh won’t be resting on a lump that could bruise you. 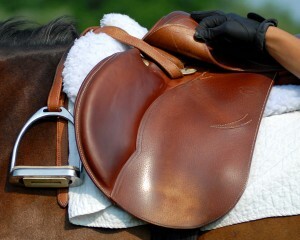 The stirrup leathers are laid as flat as possible to prevent bruising the rider's thighs. Your crotch should stay as close to the pommel as possible during this exercise, so that you are forked into the saddle with a secure thigh and knee position. (If you begin to slip backwards, grasp the pommel with one hand and adjust your position by pulling yourself forward.) Your calves should rest snugly against the animal’s sides, and the toes of your boots should be tipped upward as though you still had your feet in the stirrups. When working without stirrups at the sitting trot, then, your leg position should be exactly the same as it was when you had stirrups. Concentrate on relaxing your stomach and thigh muscles at the sitting trot so that you won’t bounce. Take a deep breath and let it out slowly, allowing your weight to sink downward. Remember, pinching at the thigh or tightening the stomach muscles draws you upward, away from the horse’s back, and causes great discomfort for both you and the horse. Jessie Springsteen demonstrates how the rider can use both hands to adjust the seat forward at the sitting trot while being longed. If you have trouble slipping back in the saddle, having someone longe your horse while you work on your position can be very beneficial. Your eyes should be lining up the centers of the fences and establishing a focal point at the end of the line of fences, giving you a specific point to which you must ride. When determining what adjustments must be made to meet a good take-off spot, you should still be aware of your focal point through use of peripheral vision. By looking soon enough and not allowing your eyes to wander for even a moment, you will notice that your success rate in meeting good spots will greatly increase. As for the importance of rhythm, the reason for maintaining a steady tempo on course is to prevent the horse from having to change its pace drastically at the last moment to reach the correct take-off spot. Typically, the problem of erratic pace arises when a rider allows his horse to slow down when passing the in-gate. He must then drive the animal forward too forcefully a few strides before the upcoming fence to have enough momentum and length of stride to travel between the fences in the correct number of strides. To prevent this error, concentrate on maintaining even strides throughout the course, partaicularly when you are traveling past the in-gate or out-gate. This will make it much easier for the horse to meet the fences properly. To improve your ability to dictate a steady tempo to the horse, practice humming a three-beat song or simply thinking a steady rhtyhm, such as “dah, dah, dum”….”dah, dah, dum,” throughout the course. An instructor can help you develop a stronger sense of rhythm by steadily beating out the downbeat for each stride–that is, the third beat, in which the horse’s leading leg strikes–using a riding crop against a jump standard. Another option is to obtain a battery-operated metronome and use it with a megaphone or microphone to project the appropriate tempo. The metronome is particularly practical because it provides a continuous beat that can be adjusted to suit your horse’s ideal rhythm. Notice after fence 2 that the rider must look early (indicated by an X) for the upcoming diagonal line. After fence 4, the rider doesn't have to look quite as soon toward the outside line, but should be looking for the next line of fences as he crosses the centerline. When a horse balks at the ingate or outgate, the problem is known as being “herd bound.” The horse is balking at the ingate because it wants to quit work and go visit with its buddies outside of the ring. (Of course, the barn, food, baths, etc. are also fond memories that pull the horse toward the gate like a magnet.) To correct this problem, use your crop at the moment the horse begins to balk, so that it is clear that you won’t tolerate this behavior. Apply the crop on the horse’s barrel, just behind your calf. If the animal is drifting toward the gate as it balks, you should apply the crop on the side to which the horse is drifting–for example, if the animal drifts left, then apply the crop on its left side. This way, you are punishing both the balking and the drifting at once. Be sure to apply the crop with the force you think will be appropriate to correct the problem. If this is not enough, punish the horse again with the stick, a little harder the second time. Increase the amount of force until you get the desired result, for if you continue to apply an ineffectual amount of stick, then you will simply irritate the animal and heighten its bad behavior. Hopefully, you’ll be able to solve this problem during schooling. If not, you may have to apply the stick occasionally in the show ring, just to let the horse know you mean business at all times. If your correction is consistently prompt at the first sign of balking, soon the animal will learn not to challenge you. To bring your horse back to a state of fitness, you should start with slow work, mainly walking and trotting the first two weeks, then adding some canter work the third week. By the fourth week, you can start muscling up the quarters and improving the horse’s wind by trotting up a long, gradual incline that has good footing–about three or four times up the incline three times a week. It’s surprising how fast you can get a horse fit with this easy regimen. You can also do a little jumping at this point, doing gymnastics one day a week and practicing on single lines another day. If you are into Eventing, your horse will need to be fitter than the normal show horse, and your work regimen will be a little different. On the fourth week, you can begin to practice over single cross-country fences, and on the fifth week add some gallop work–about one minute of gallop two times a week–while doing the work on the incline on other days. From here on, devise a schedule based on the demands of upcoming competions, keeping in mind that your horse should be fit enough to have clear, rather than foamy, sweat when it is in hard work, whether it is showing or eventing. The horse should also have an increase in muscle and a decrease in its “hay belly” as it becomes fit. Finally, the horse’s wind should be sufficient so that the animal doesn’t seem to struggle to get enough air during hard work. Once you observe these physical signs, you know your horse is ready to compete.